Independence is more than just a transition; it’s a transformation, an opportunity to own what you’ve created and build a legacy you can pass on. With Dynasty Financial Partners, you’ll work with our professional transition team that partners with you before, during and after your launch so you take exactly the right steps at the right time. No roadblocks, no detours, no wrong turns. We’ve perfected the route for our Network, and with our resources and expertise behind you, we can make your journey a successful one. 3/31/19 - A Diehard Merrill Advisor's Journey to Independence. Listen to Michael Henley, Founder & CEO of our partner Brandywine Oak Private Wealth, share the story of his journey to independence on Mindy Diamond's podcast: Mindy Diamond on Independence. 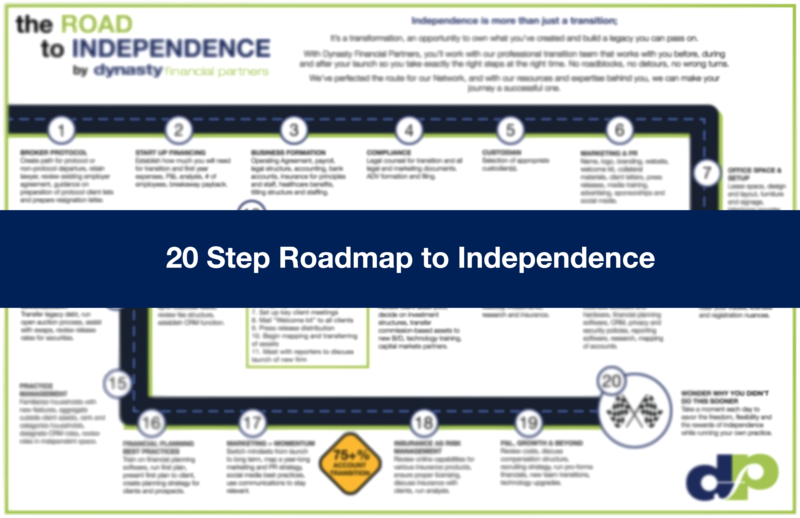 Read why these clients are pushing for their advisors to breakaway and how the “the road to independence has become a highway,” according to Dynasty CEO Shirl Penney.